Who is given most voiceover time in this clip? Why is that significant? The clip begins with a camera mounted in a plane flying over an outback Australian landscape and juxtaposes that with shots of a camera ‘flying’ over an indigenous painting. Why is this done? What meanings does it encourage viewers to make? In the voiceover, the viewer is told that ‘it’s all our country’. To whom does the ‘our’ refer and not refer? Explain. How is the representation of the Australian landscape in this clip similar to or different from that found in the Endeavour Journal video clip? The painter states that only certain people are allowed to paint this dreaming. Who and why? What are the possible meanings of the concentric circles, u-shapes and colours, as explained in the voiceover? Do the ‘codes and conventions’ used in the painting mean the same to everyone? How are indigenous culture and people represented in this clip? Is this unusual or surprising in any way? Why? Indigenous culture has developed over thousands of years in a particular environment. Discuss the difficulties and problems, as well as the opportunities that are created for traditional culture in a modern world. White Australians tend to refer to Aboriginal culture as the ‘Dreaming’. Collect a number of definitions of this term. What are the consequences of going along with or rejecting various versions? 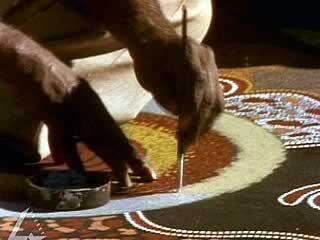 In groups, debate whether or not Aboriginal art as a way of telling stories about Australia deserves a place along side Western ways of telling stories brought to Australia by British settlers, e.g. novels, poems and songs. For example, should we value the work of Michael Nelson Tjakamarra as highly as Henry Lawson, Henry Handel Richardson, Judith Wright or Peter Carey? Alternatively, write a feature article for a mainstream Australian newspaper.